Arwen Undómiel (b. 241 T.A.) - The daughter of Elrond and Celebrían, sister of Elladan and Elrohir. Her name means "noble maiden" (Evenstar - "Evening Star") and she was the fairest Elf maiden of the Third Age. And when Aragorn first laid eyes upon her, he was immediately enchanted by her. "'I am Aragorn, Arathorn's son, Isildur's Heir, Lord of the Dúnedain'; yet even in the saying he felt that this high lineage, in which his heart had rejoiced, was now of little worth, and as nothing compared compared to her dignity and loveliness. "'But she laughed merrily and said: "Then we are akin from afar (because Aragorn was descended from Elros, Elrond's brother) . 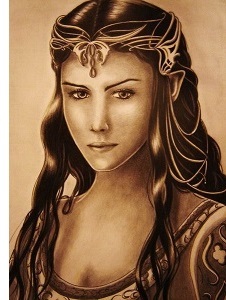 For I am Arwen Elrond's daughter, and I am named also Undómiel.